Following the account of the ministry of Christ among the Nephites as recorded in the Book of Mormon, Christ gave a charge to His New World disciples (Mormon 9:22–25). These words are nearly like the commission of Christ to His apostles at the end of the Gospel of Mark (Mark 16:9–20). According to the general consensus of modern Bible scholars, Christ did not speak those words; they are a later addition. If so, this is a problem for the Book of Mormon. Fortunately, recent modern scholarship offers compelling reasons for overturning the old consensus against the longer ending of Mark. 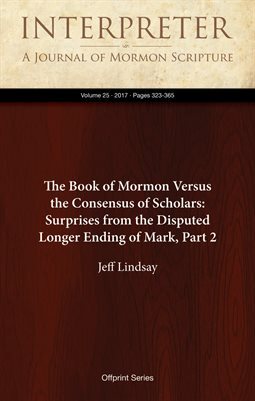 In Part 2, we examine further Book of Mormon implications from the thematic evidence for the unity of Mark.